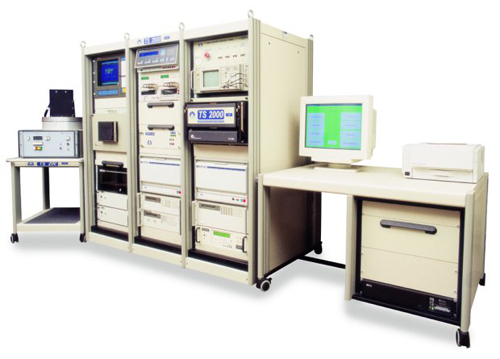 F-16 SMS Test Set - TS-2000 | Marvin Test Solutions, Inc.
A member of the FAST™ (Family of Armament Systems Testers) family, the TS 2000 offers enhanced digital test capabilities to these open-architecture, cross-platform, general-purpose mixed-signal testers. The TS-200x is mounted in a three-bay, 19" rack system with an attached workbench. A master control panel (MCP) provides AC power control (Mail, CPU, Aux, and Cable Tester), power on indicators, emergency shut-off switch, and auxiliary user power outlets, The racks also provide accessory storage drawers and retractable shelves. A 20” touch screen SVGA monitor provides an interactive operator interface. The software is menu-driven and safeguards have been included to prevent operator errors. The user may request on-line help from any menu display by the TS-200x. Help screens contain information about the menu and about operating procedures. The TS-200x provides for future growth (both hardware and software). Its interface can accommodate additional signals and its plug in chassis (VXI and PC) have spare slots. The TS-200x software allows for additional TPS development using ATEasy, Marvin Test Solution’s test software development environment (all TS-200x and AN/TSM 205/206 programs are developed in ATEasy). The TS-200x comes with a power-up Built-In-Test and extensive Self-Test. The Self-Test provides fault isolation to the module level. Since the test set is of modular design, most repairs can be completed in less than one hour. The TS-2000 is supplied with a software package that includes a virtual panel stand-alone application, driver, and on-line documentation. The virtual panel can be used to interactively control the instrument from a window that displays the current instrument settings and allows you to control and change them. The driver is a library of functions that is used to control and change the instrument settings from within your application. The instrument driver is provided for Windows operating system (32 bit DLL). In addition to the driver library, various interface files provide access to the library from your favorite programming tools and languages. These interface files support programming from ATEasy, C/C++, Microsoft Visual Basic, Delphi and more.